Sometimes I invite guest bloggers, from other specialities, to post on the Blog. The only trouble is that they do it so much better than me. Lucy Frost and Peter Wells are no exception. In a thought provoking, inspiring and moving blog they help us to think about spiritual care. And if you want any more stories by Lucy you can visit her blog at http://t.co/7hkpKRG4x5. A Strategy for equality and diversity? Tick. Meeting of ‘Spiritual need’? Tick. Of course, we seek to holistically meet the needs of those we care for. It’s a tough ask in a very busy hospital. What is spiritual need anyway? Ah, of course, it’s the essence of who we are. Sharon Janis in Spirituality for Dummies helpfully talks of the great divine light that shines in us all. Of course, the word ‘spirit’ can be whatever gives ‘meaning’ as an individual. I can tell you plenty of stories of clumsy attempts to meet spiritual need, but you’ve probably heard them before. You know, the wheeling across to the chapel on a Sunday a handful of patients, fit enough to make the trip. Probably because *Mrs Jones daughter said mum went to church once in 1953. The setting up of a table in a corner with a selection panpipe CD’s and a sign saying ‘Spiritual Space’ (Yes – I have actually seen this). Easy to feel disheartened then. So it feels quite hard to meaningfully give spiritual care for a person with dementia: How can we bring comfort to those we care for? A quick fire search of ‘religion and dementia’ finds articles and web sites lauding the ‘comfort’ faith can bring. This is surely true if the opportunity to embrace one’s own faith is given truly and holistically. A divine light? Spirituality for Dummies can’t surely have it nailed so simply? Is that really what exists within us? That can’t surely be the definition of what lies within ourselves? So many questions, and not really a right or wrong answer. So, how do we, as nurses, doctors, health care staff, reach out to that light and meaning that’s there inside all of the people we care for? Of course!! We call the hospital chaplain/ Imam / faith leader, because he/she will have all the answers. Alas they are not always available instantly. Trouble is, for those of us who help people with dementia – they often are living for the moment. ‘Sorry, could you just wait while I contact the hospital chaplain now I’ve assessed your spiritual need’ – It’s just not going to cut it. ‘Why did God give me dementia?’ This is a question I was faced with not so very long ago. A person with a recent diagnosis of alzheimer’s disease asked me this. This person had a strong Christian faith. They said: ‘I must have done something really bad for this to happen’. Patricia Higgins, writing in the Catholic Medical Quarterly, reminds us of the need not to confuse spirituality as being the same as religion. A common mistake it seems. So, what did I say to this person who asked me possibly the very hardest question I have ever had to answer? To be honest, its times like this, when you could use an hour or two to think about the right answer. Well, I didn’t have two hours – I had that one precious moment to help this person in their time of need. I said ‘I don’t know. I don’t think it was God that gave it to you, it seems like it’s your body that has given you dementia. Maybe your faith in God will give you the strength to live with dementia’ ‘I hope so’ was the reply. Hope! I realised that in hope lies a possible answer to this conundrum. What always amazes me, and inspires me is this: The people with dementia I am so privileged to help, still have hope. They have lots of hopes. Yes: People with dementia have hopes, fears, dreams and aspirations as we all do. Why shouldn’t they? A hospital is where people come in a time of crisis. I see a lot of people living with dementia, for who life is throwing a lot of challenges their way. For this person, their reply of ‘I hope so’, came with a smile. As we held hands – I felt I had helped to connect them with their feelings of hope. Hope through faith in this person’s case. Wow: What a moment. What an utter privilege for me as a nurse. A person with dementia might be hoping they will not need to move to a care home, they may hope friends will still visit, still care even. They may hope for their physical health to remain robust. The point is, there does always seem to be something to hope for. We must help the people we care for reach for that hope. Maybe that comes from ‘recognising that light within’, but it definitely comes from seeing the person and not the illness. Faith might be religious, it might be a faith in a way of living, it might be a faith in one’s own beliefs and values. It’s deeply personal and unique to each human being. Dementia can tap away at your cognition, it can take away your physical ability to do many many things. Dementia can’t touch that light within. It can’t erase feelings. 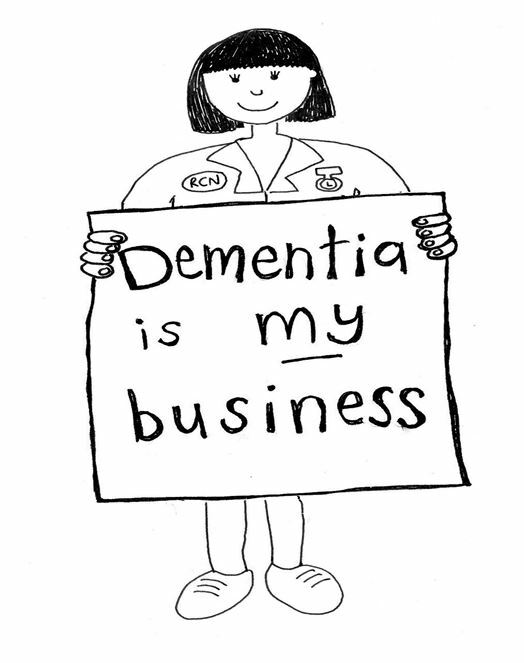 Lucy Frost: Dementia Champion and Nurse Specialist, Brighton and Sussex University Hospitals NHS Trust. Reverend Peter Wells: Lead Chaplain, Brighton and Sussex University Hospitals NHS Trust kindly proof read and assisted the author with this blog.